With the rising demand for organic milk, more dairy operations are choosing robotic milkers to help increase milk production, answer labor issues and help with herd health. 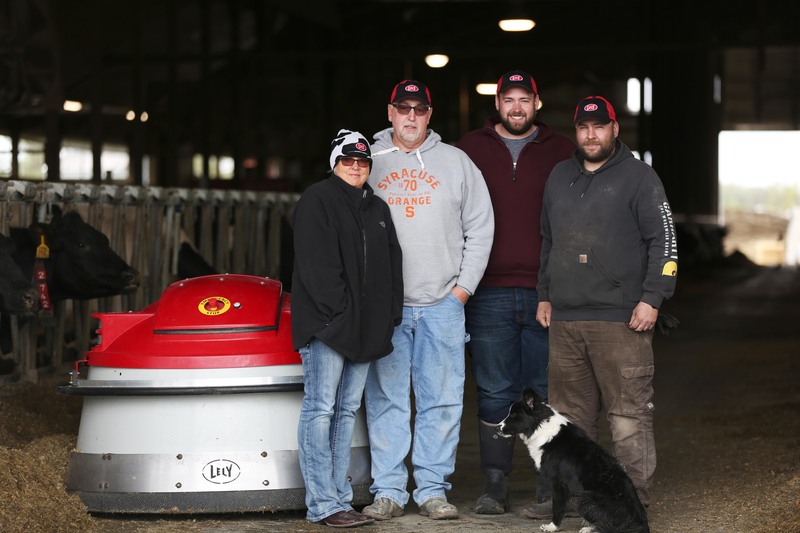 The ease and accuracy of the new technology, coupled with the rising labor costs in New York, were some of the reasons the Murrocks decided to update to their robotic milking systems last year. Organic food sales in the U.S. reached new records in 2015, hitting a benchmark of $43.3 billion. Darryl Murrock, who farms with his sons, Dillon and Jeffery, near Watertown, New York, became an organic dairy farm in 2007 in order to meet consumer demands. Last year, he and his family began using four Lely Astronaut A4 robotic milking systems. They have since added a fifth robotic milking system in January 2017. In June of 2017, they also a Lely Calm automated calf feeder. With this technology, they are able to divert organic milk from the robotic milking system directly to the automatic calf feeder to feed their calves. The Murrocks, who have about 225 cows, had been milking three times a day in a traditional parlor, where they averaged 72 lbs. (33 kg) of milk per cow. Since their January 2016 startup with the robots, their milk production has averaged 86 lbs. (39 kg) per cow. Darryl Murrock says the quality and butterfat content of the milk has gone up since implementing the robots. He also says this system is more cow-friendly than the previous milking system. Each cow has an electronic collar tag that allows the robot to identify and organize production and health records for individual animals. Collars also contain an activity monitor for heat detection and a rumination sensor for monitoring rumen function, so there is an indication of digestive system health. Robots collect detailed data of cows’ body weight, milk yield, milking time, preparation time, rumination time, activity, heat probability, milk color and milk conductivity. There are often questions about organic dairies using grazing systems with robots. The main challenge for grazing with robots is to ensure good cow traffic, motivate cows to get milked, go out and graze and return to the barn to be milked again. Lely utilizes ABC grazing, which sends cows to different grazing areas (A, B or C), depending on the time of day, and the Lely Grazeway allows cows to go from the barn to the pastures and return again to be milked. With a free-flow traffic system, cows are regularly incentivized to use the robot through the offering of concentrates. These concentrates complement the feed they receive with the partially mixed ration at the feed fence. The question everyone asks is “how can cows be motivated to milk when grazing is involved?” Instead of the concentrates, access to fresh grass multiple times per day through the ABC grazing system is the positive motivation. When the motivation of a cow changes, it is important to safeguard this via the correct pasture. The Pasture Dairy Center at Michigan State University (MSU) integrates robot technology and pasture-based management. It is one of two MSU dairy farms and works to expand the research capacity of MSU. In addition to robots, they use the Lely Grazeway selection box for steering the grazing system, according to Howard Straub III, dairy manager at the center. Cows choose when they want to go out to pasture. The Grazeway then determines whether or not they are eligible based on the last time they were milked, using the same cow-recognition system that is used with the robot. “When we transition back to pasture in the spring, we use the Grazeways as much as possible. While most of the cows will remember how to use the selection gates, there may be new heifers that have never used them. The more they go through them, the better,” Straub said. He recommends transitioning the cows to pasture slowly to help the cows’ rumen microbes transition to the new feed stock. Straub said at MSU, the first day out on grass is two hours long. The second day is four hours, and so on until the sixth day when they are grazing half days. The cows are retrieved from the pasture after each of these time periods end. On day 10, set the Grazeway selection box for 12 hour access, but do not go get the cows. On day 14, the Grazeway are functioning 24 hours a day (fully grazing). While this schedule can be somewhat flexible, recommendations are to take no less than 10 days to fully transition to grass. Straub recommends introducing pasture to cows after cows have been fed. This will reduce the amount of grass that is initially ingested and reduce instances of bloat. Cows should feed two hours before the transition grazing events in order to give them plenty of time to fill up. As the transition continues, there will be a reduction in a partial TMR (pTMR) feed intake. You can reduce the amount offered to control weigh backs, but don’t short the cows on feed offered. They will reduce it on their own time. In the fall, Straub recommends that dairy producers convert cows to winter rations slowly. He recommends a minimum of four weeks when changing the cows forage diet to winter “partial” TMR (pTMR) or balage, slowly increasing the percentage of intake. This will reduce the stress of a diet change on the herd. Success factors in grazing while using a robotic milking system are: ensure good cow traffic, management of grass quality and quantity, access to pasture, outside access to water and adjusting to changing conditions.